I am not an activist. I wish I were. I wish I knew what to do. Have you heard of “Thinspiration?” “PrettyThin?” and “ProAna” sites? As I was researching the article posted on Monday, I stumbled or “tumbled” across mentions of such websites. My ambition was to read these and write a commentary. I desperately want to illuminate the viscous lies associated with each of these sites. But I can’t do it. I can’t read them. I can’t make it past the first few pictures before I feel literally sick. I am crying. Let me promise you, NO ONE enjoys an eating disorder. You cannot promote an eating disorder or be “pro-ana” with a clear conscience. It’s called a disorder for a reason. 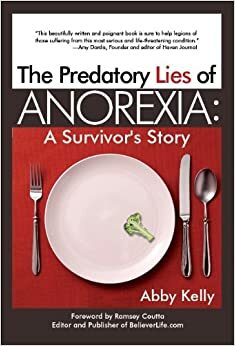 One cannot pretend anorexia is an acceptable lifestyle anymore than one would normalize any other disorder: schizophrenia, agoraphobia, social phobia or panic disorder. Would you want to live with, even “improve” and practice such conditions? Seriously? We live in a fallen, sinful world. To simply facilitate chatter about such topics does NOT lead to healing. One of the sites I mentioned above is run by a man who professes to have no eating disorder, but firmly believes he would be doing society a disservice not to run his website. He believes he is “doing what no one else would do and what needs to be done.” What exactly is that? He offers no opinion or personal stance on the issue, stating only that he is creating community and establishing communication and support. Support for what? I don’t have the magic words to repel these lies. I don’t have the perfect words to offer healing and comfort to those caught in the middle of an eating disorder or watching a loved one die. I offer one resource that has reached the places of my heart that no counselor or book or well-meaning friend has ever done. Please visit Music for the Soul. If you would like a copy of this CD, please let me know. I will see that you get one. I had no idea such websites were out there. And I think you were incredibly brave to try to investigate them to write about them. Hugs to you! I, for one, am very thankful that you wrote about this – my daughter is only young, but to know that such sites are there and ‘accepted’ is important to protect her for the future. I know the idea of pro-ana is shocking, but in reality it’s mostly just a bunch of attention-seeking teenagers trying to makes their diets sound cool. The “tips” exchanged are essentially the same things said in Weight Watchers meetings, and the vast majority of participants in these communities are not actually disordered. Furthermore, the “but they cause EDs!” outcry from the media is unfounded, as research increasingly demonstrates that eating disorders have just as strong a genetic/neurological component as “traditional” mental illnesses such as schizophrenia (and no one would worry that you could “catch” schizophrenia on the internet). Yes, these sites are a little disturbing, but they are not the enormous menace they’re sensationalized to be. I hear what you’re saying and as a journalist, I admit that much of what the media reports is sensationalized and blown out of proportion. But, as a recovered anorexic and a personal trainer, I can’t think of a single benefit of these websites. NONE! If their only result is harm – however minimal – they shouldn’t be there. But as a journalist, wouldn’t advocating their removal simply because they are harmful be a fairly aggressive pro-censorship stance, and wouldn’t it also call for the removal of an enormous amount of other “harmful” material? I’m not saying they necessarily do have any positive value, but I find it difficult to stand behind such substantial censorship–especially of content which in many ways is identical to unscrutinized diet, health, and beauty content. Again, I understand your position. I’m not staging a protest or demanding that some authority shut them down. I am calling for self-regulation. What benefit is the site’s creator deriving – and is their personal benefit (if there is any) superior to the possible detriment their work is causing to others?